Emergency situations can arise at any time. While it is difficult for pet owners to be prepared for these situations, you can do your best to know how to help your pet by learning a few first aid basics. The experts here at Gulf Coast Veterinary Specialists (GCVS) have a few tips for you! If you believe that your pet is bleeding internally, try to keep them warm and calm while you transport them to an emergency veterinarian immediately. If you notice that your pet isn’t breathing, you should first check to see if your pet has lost consciousness. 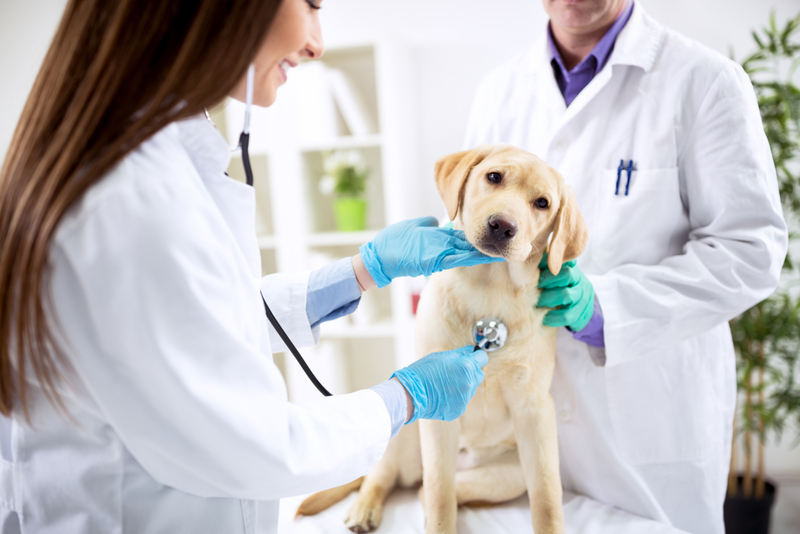 When possible, while you are helping your pet, you should have another person call a veterinarian. To help your pet, open the airway by gently pulling the tongue forward and out of the mouth until it is flat. Then check to see if your pet is choking (if so, check out our tips for choking below). You can perform rescue breathing by closing your pet’s mouth (you will need to hold it closed) and breathing into your dog’s nose with your mouth until you see the chest expand. Once the chest expands, you can continue the breathing once every four or five seconds. It is important that you stay calm if you realize that your pet doesn’t have a pulse. You can easily do more harm than good if you begin chest compressions before you assess the situation. The first step to helping a pet without a heartbeat is to make sure your pet’s airway is open. To do this, follow the same steps as detailed in the previous section. Once you have an open airway, lay your pet on its right side on a firm surface. Just behind the elbow of the front left leg is where the heart is located. Place one hand under your pet’s chest for support and place the other hand over the heart. For dogs, press down gently on the heart about one inch for medium-sized dogs. For larger dogs, press harder, and press more gently for smaller dogs. For cats and even smaller pets, cradle your hand around your animal’s chest so that your thumb is on the left side of the chest while your fingers are on the right side of the chest. Compress the chest by squeezing it gently between your thumb and fingers. For larger animals, press down between 80 and 120 times per minute. For smaller animals, press down between 100 and 150 times each minute. Alternate between rescue breathing and chest compressions. Do chest compressions for four to five seconds and then perform one rescue breath. Continue until you can hear a heartbeat and your pet is breathing normally or you make it to the veterinary clinic. If your pet is overheating, you need to try to cool them off and get them to a veterinarian right away. Start by getting your pet out of the sun. Then, place a cool, wet towel around their neck and head without covering the eyes, nose, or mouth. Be sure to rewet the towel with cool water every few minutes. You can also use a hose or other form of running water to help cool your pet. You will want to use your hands to massage your pet’s legs and sweep the warming water away as it absorbs the body heat. Never use ice on a pet with heatstroke. Always get your pet to a veterinarian right away. Poisonings can be very confusing for pet owners. You should first try to determine the cause of the poisoning so that you can alert the veterinarian. If your pet has been poisoned, you should call either the Animal Poison Control Center Hotline or an emergency veterinary clinic immediately. You will need to provide basic information about your pet, such as breed, age, and weight. Give the hotline operator or veterinarian the symptoms your pet is displaying as well as the name of the toxin and all information they request on the packaging. You should follow any instructions you are given, and then seek veterinary treatment as soon as possible. Please bring the package and any residual poison in a sealed bag for review by the attending emergency veterinarian. If your pet’s skin or eyes have been exposed to the toxins, you will want to wash it off. Use soap and water to wash the skin and flush the eyes with water to clean out the toxins. To reach the ASPCA Animal Poison Control Center Hotline, call 1-888-426-4435. The hotline can be reached at any time, as it is a 24-hour hotline. Choking symptoms include difficulty breathing, excessive pawing at the mouth, blue lips or tongue, and choking sounds when breathing or coughing. The first thing you should do is check to make sure your pet is still getting air. If your pet is breathing, you should try to keep them calm and get to the veterinarian right away. However, if your pet is struggling to breathe, you should try to look in his/her mouth to locate the object causing the choking. Be careful, because as your pet chokes, they may panic and try to bite you. If you can see the object, carefully try to remove by sweeping it away with your hand. You can also try to remove it with a pair of tongs, tweezers or pliers, but be careful that you don’t push it further down your pet’s throat. If you can’t get the object quickly, just focus on getting your pet to the veterinarian. If you can’t get the object out or your pet collapses, you can try to perform a modified Heimlich on your pet. To do this, grasp your pet around his/her waist and place both hands underneath your pet’s rib cage and apply quick, firm pressure. If that doesn’t seem to work, you can place your pet on his or her side, and strike the rib cage firmly with the palm of your hand three or four times. This motion will sharply push the air out of your pet’s lungs and push the stuck object from behind and out of the throat. Keep trying this until you dislodge the object or reach the veterinarian’s office. To be a pet first aid expert, you can take a pet first aid class where you will learn all about how you can help your pet in emergency situations. While there are in-person classes, the team at GCVS recommends taking the online class offered by the American Red Cross. During this class, you will learn how to check your pet’s vital signs and recognize when you are in an emergency situation. The class will teach you how to provide basic first aid to your pet until you can get to an emergency veterinary clinic like GCVS. The class covers first aid for situations like bleeding, cardiac emergencies, seizures, and more. You can also download the American Red Cross Pet First Aid app for help on your smartphone anywhere, anytime. If you live in Houston, Texas, contact GCVS during a pet emergency at 713-693-1111 or come in right away. Our emergency clinic is open 24 hours a day, seven days a week.